The drama in Clark Kent’s world continues, as matters at the Daily Planet hit a boiling point. Clark’s new co-worker is clearly not what she claims to be, but her reasons for infiltrating the great metropolitan newspaper have yet to be revealed. But both Perry and Clark know there’s more to this than meets the eye. Meanwhile, an old co-worker pays a visit to the Daily Planet. AND the secret of the fires that have plagued Metropolis has begun to unravel. 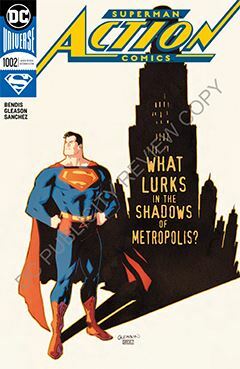 AND the Guardian has been sidelined my a mysterious “thing.” AND someone else steps back into Superman’s life, though the how and why behind it will have greater ramifications in issues to come. So as you can see, dear reader, there is a lot of meat on this bone, but mostly mystery meat, in the sense that very little is genuinely explained. Most of it is a trail that leads off into the distance, as yet unseen by the audience’s eyes. I must admit, I was skeptical of Bendis’ run on the Superman franchise, though that was largely because He was such a name at Marvel. It was my fear that his tenure might influence Bendis to “marvelize” the Man of Steel. But as of this writing, I’m not convinced that would be a bad thing.